Mr Kamuldele’s artistic vision stems from personal experience as a former refugee, documented in last week’s instalment of our Painting a Picture section published in Thursday’s edition of The Border Watch. After spending the first two decades of his life surrounded by violence, he lived in a refugee camp for 13 years before relocating to Australia with his family in 2016. Upon their arrival, Mr Kamuldele’s children entered the school’s new arrivals program and thus developed a strong presence in the Mount Gambier North School community. Once his artistic talents became apparent to school leaders, staff combined efforts to commission Mr Kamuldele for the mural. Self taught and beyond impressive, Mr Kamuldele’s work is emotive and detailed. He said it was an honour to paint at the school. “I feel very happy to be painting this mural and creating something meaningful for the school,” Mr Kamuldele said. School intensive English language program leader Inna Tucker said the school was pleased to have Mr Kamuldele on board. “His work on the mural so far is incredible and we really wanted to highlight the skill of someone from within our school community,” she said. Ms Tucker said she was in awe of Mr Kamuldele’s work. “The mother he has painted on the wall so far is just beautiful and her eyes really tell a story,” she said. “She represents all of the parents and carers who walk through the school gates every day. Following the school project, Ms Tucker said she would like to see Mr Kamuldele create more artwork elsewhere in the city. “It would be great to see some of Sadiki’s work appear at various locations in Mount Gambier,” she said. 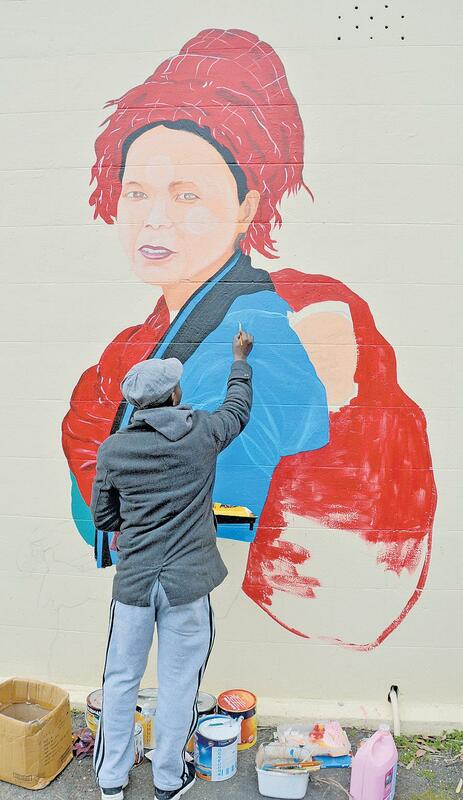 In progress: Artist Sadiki Kamuldele paints a mother as part of a large-scale mural at Mount Gambier North School.